Series DFX Ultrasonic Doppler Flow Meters measure flow of liquids that contain useful sonic reflectors1 suspended within the liquid. 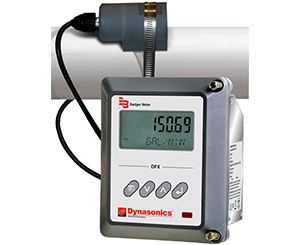 The DFX flow meter operates by transmitting an ultrasonic sound from its transmitting transducer through the pipe wall into the flowing liquid. The sound will be reflected by the the reflectors and recorded by the receiving transducer. The clamp-on style transducer is also available in small pipe and high temperature options. The DFX also offers an insertion probe transducer for pipe systems that do not permit ultrasound penetration. The Series DFX replaces the 601, 901, and 770 models; using more advanced technology for easier installation and more reliable readings on a wide range of liquid and reflector conditions. Unlike other Doppler technologies, the Series DFX is relatively insensitive to VFDs and other ultrasonic noises.